Store the complete kit at 2–8°C. Under these conditions, the kit is stable until the expiration date (see label on the box). 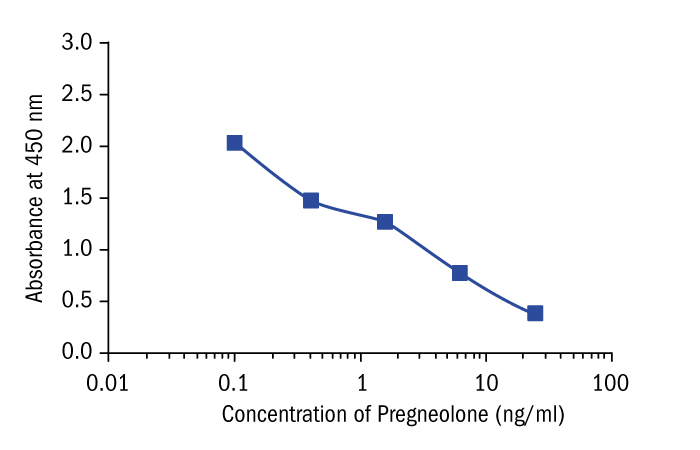 Pregnenolone is the first steroid to be derived from cholesterol in the pathway of steroidogenesis, and it is the common precursor for all of the adrenal and gonadal steroids. Its production occurs in the mitochondrion by cleavage of the C-20 side chain of cholesterol by the P-450SCC enzyme. Elevated pregnenolone levels occur in forms of congenital adrenal hyperplasia. The determination of pregnenolone in serum may be useful for studying its metabolite, pregnenolone sulfate, which has been reported to have various effects in the mammalian brain and central nervous system.